Rush Bros. is somewhat difficult to describe at first glance. Part Super Meat Boy, part TrackMania, part European nightclub, the 2D sidescroller draws its inspirations from a wide variety of sources. Harsh visuals and a heavy soundtrack accompany demanding levels in what is, at the very least, an interesting experience. The end result isn’t perfect, but it damn sure has its moments. Rush Bros. wears its influences on its sleeve. With gameplay mechanics and obstacles reminiscent of the masocore genre (think Super Meat Boy and I Wanna Be The Guy), the majority of the game is spent hurtling through difficult 2D death traps in search of a level’s goal. However, one aspect that differentiates Rush Bros., other than its severe visuals, is the game’s openness. From the point of purchase, each of the 40-ish levels are open for play, with the entire soundtrack at your disposal. Whether playing by yourself or competing with others online,you’re free to jump straight into any level you choose. These stages vary from huge circling fetch quests with multiple keys to be found, to straight-up linear races with giant serrated blades nipping at your heels. No matter what the goal, the real attraction of Rush Bros. hinges on its multiplayer. Unlike many of its wholly single-player focused contemporaries, Rush Bros. attempts to introduce a competitive time-trial structure. Much in the same way that a game like TrackMania pits players against each other in a non-direct manner, Rush Bros. will throw another person in the mix for added incentive. Even when playing online, split-screen gameplay is an option, and actually proves to be quite useful. This opens up the ability to keep track of your opponent, as well as pick up the occasional pointer. It’s not a groundbreaking change, but it’s the sort of feature that kept me hooked on TrackMania two months after its release. The sights and sounds of Rush Bros. can be chaotic and bombastic in the best ways possible. Israeli psytrance group Infected Mushrooms top the list of numerous electronic performers that line the soundtrack. And all of the skull shaking energetic tracks blend amazingly with the almost painfully intense visuals. Obstacles will pulse and flutter to the beat of the soundtrack, creating an extremely busy, albeit entertaining backdrop. If Rush Bros. is anything, it’s visually and aurally interesting, almost to a fault. Levels can sometimes become so overwrought that it directly affects gameplay. Environments can be so full of random structures that it’s difficult to tell what’s in the background, what will kill you, and what can be safely landed upon. Most levels are quite lenient with checkpoints, often restarting you right before whatever devilish contraption killed you, but this will lead to many a cheesy death. The sometimes confusing level layouts, however, are not the only downside to Rush Bros. There is also a slight looseness to the controls, especially in regard to air control. Games like Super Meat Boy live and die by the absolute pinpoint accuracy of each and every movement. Death is always your own fault, because complete control is always at your hands. Unfortunately Rush Bros. lacks a level of air control needed to navigate many of the tight corridors it throws at you. None of the hazards ever present an impossible task, but I often felt lucky instead of masterful. It’s recommended that you play with a controller, which I did, but a faint floatiness still remains. Even with these minor faults, Rush Bros. is still worth a look. 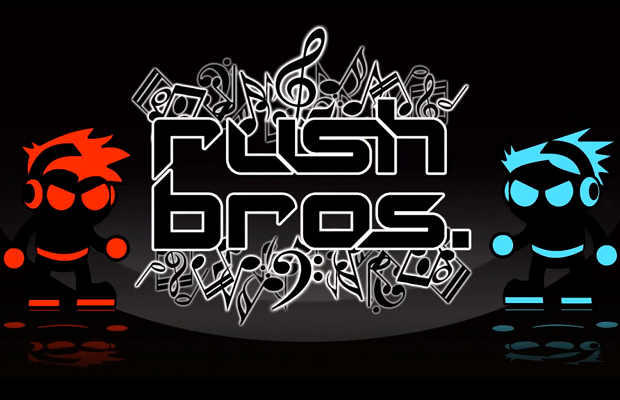 Rush Bros. makes a great initial impression, with its catchy soundtrack and unique look, but many of the levels fall apart under close scrutiny. Having a friend or two to play with definitely helps extend the game’s lifespan, and thankfully two copies can be had for $14.99 on Steam. Rush Bros. tries for a very specific aesthetic, which it manages to execute quite well, while trying to provide a wealth of different gameplay experiences. They don’t always work out perfectly, but by no means does this ruin the game.